The semi-detached house type was first used extensively in the Victorian period, when the new suburbs became home to a burgeoning middle class. 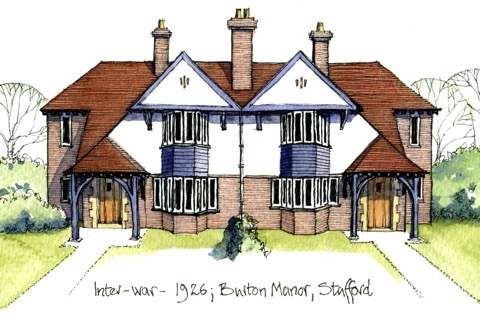 But the house type reached new heights of popularity in the Inter-war period and vast numbers of semi-detached houses were built as towns and cities across England continued to expand. Expert surveyors at Tombleson Associates are not only Members of the Royal Institution of Chartered Surveyors, but also hold high academic qualifications in the field of Historic Building Conservation. We regularly examine and survey Inter-War Period Buildings like Burton Manor, in Hampshire, Isle of Wight, West Sussex and Dorset. Contact Us Today to discuss your all Building matters entirely without obligation.